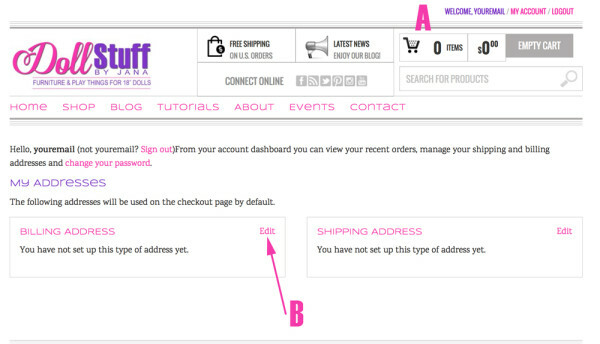 If you’re having any trouble at all setting up your account on our site, please follow these step-by-step instructions. You can click on the images to make them larger, if needed. 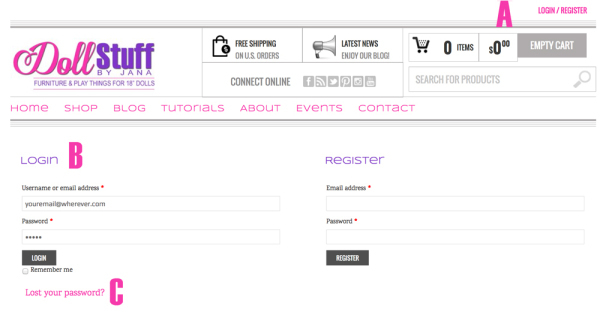 Before ordering any Doll Stuff by Jana products, you need to Register for an account. The best way is to start with an empty shopping cart. 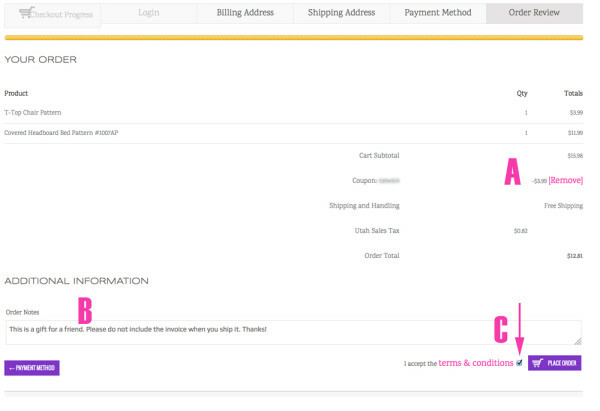 If you already have items in your cart, delete them and refresh you screen. A. 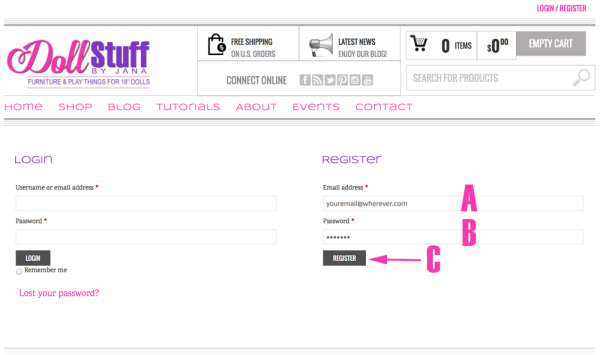 Enter your email address in the top field. B. Enter a password in the bottom field. C. Click the REGISTER BUTTON. That top right LOGIN/REGISTER link now says, WELCOME, [YOUR EMAIL]/MY ACCOUNT/LOGOUT. A. If your email is here, you are officially logged in. B. Click the Edit link to enter your Billing Address. C. Enter your information and click SAVE ADDRESS. 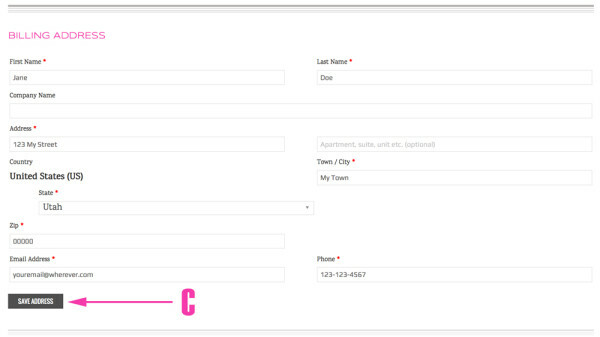 If you’ve entered all the required fields, the Billing Address update will display. If it doesn’t, you’ve left out one of the fields. Go back and make sure you’ve entered all the fields that have an *. If your Shipping Address is the same as your Billing Address, you don’t need to do anything more. If it’s different, click the Edit link in the Shipping Address box and enter your information. To add items to your cart, click SHOP in our menu. Or if you know the name of what you want, you can enter it in the search bar. A. Filter by product categories and types. B. Hover over an item and click the purple ADD TO CART button. C. Click on details to go to the Product Information Page. 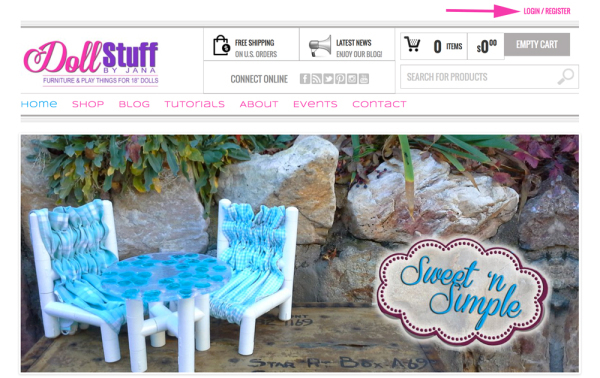 The Product Page gives you more information. A. 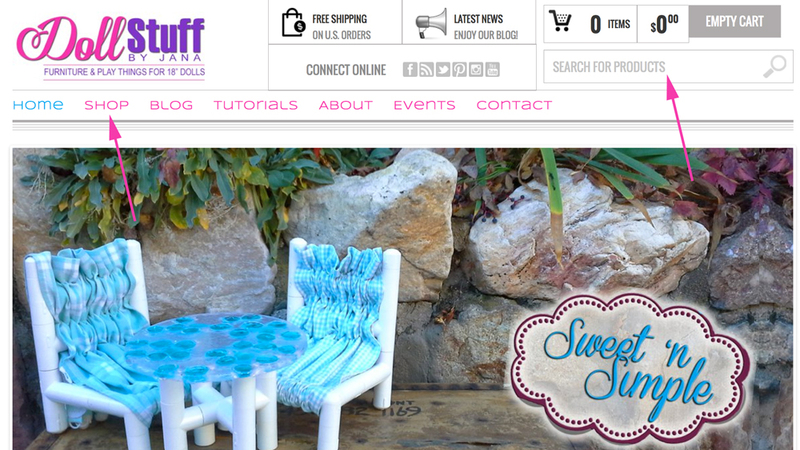 See additional photos of items you can make with this pattern. Click on any of the smaller photos to display them in the larger box. Hover over the large box to zoom in for a better look. 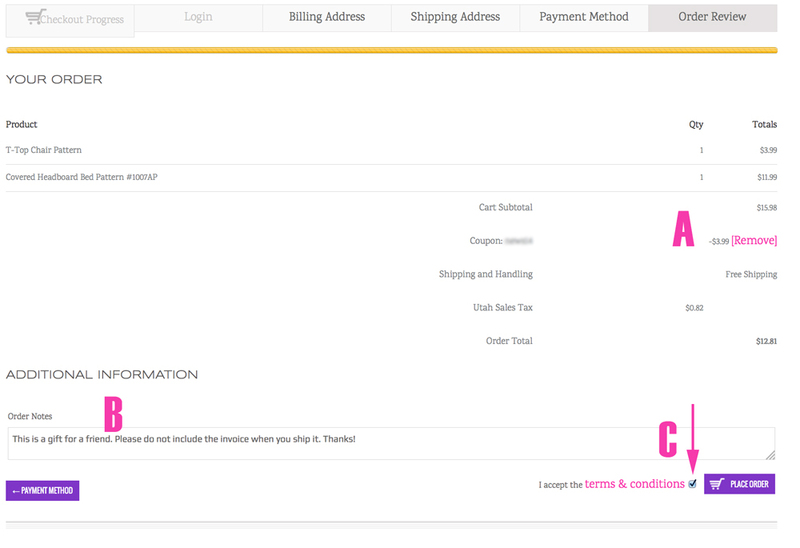 C. Change the quantity, if desired, then click ADD TO CART. 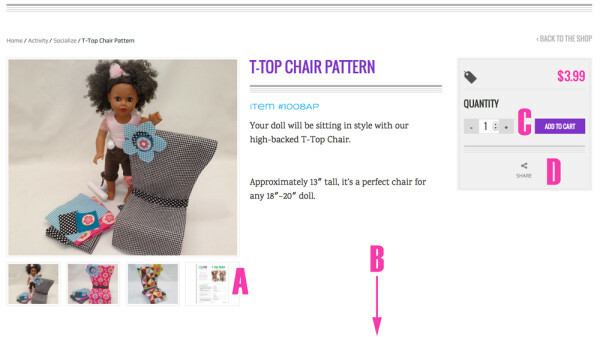 D. Share the product page with others. 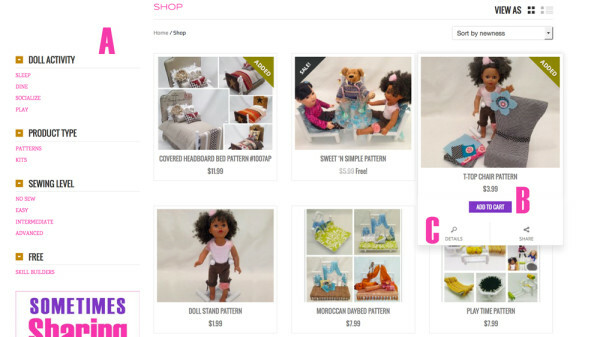 When you’ve added your items to the cart, it’s time to check out. Click the VIEW CART button. A. If you have a coupon, click the link at the top and type the code into the box. Our codes are case sensitive. You may only use one coupon per order, so if you have coupons for multiple items, you’ll need to place multiple orders. Be sure to click the APPLY COUPON button. B. 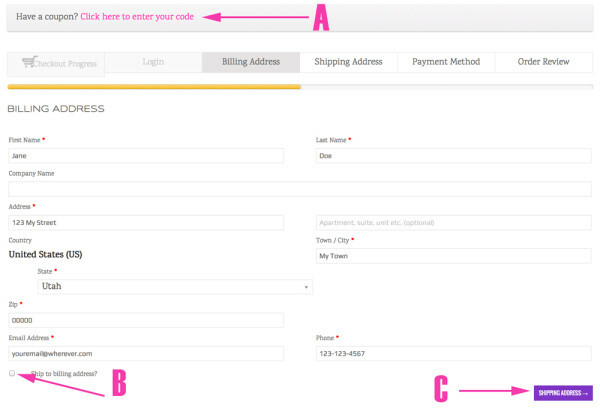 If your Shipping Address is the same as your Billing Address entered earlier, just check this box. C. Click the SHIPPING ADDRESS button. If you checked the box, the Shipping Address will auto-fill the fields. If not, you’ll be able to enter a different shipping address. 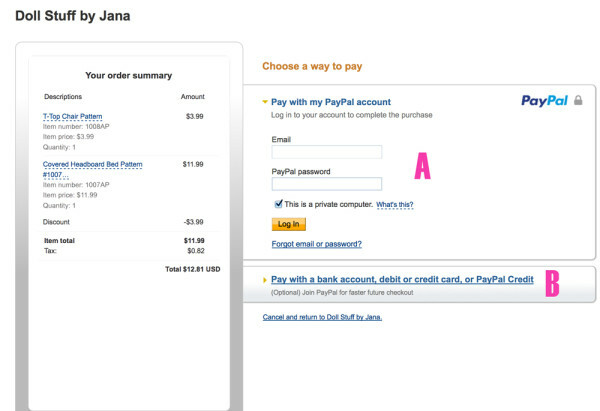 We use PayPal to process our orders, but you don’t have to have a PayPal account to use it. Check your order to make sure everything is correct. A. This is where your coupon deduction shows up. B. If you have a special request or a comment, enter it in this field. C. Check the box that says you accept our terms & conditions. We recommend you actually read them first. You MUST check the box to process the order. Click the PLACE ORDER button to go to the PayPal screen. A. If you have a PayPal account and want to use it, enter your email & PayPal password here. B. If you don’t have a PayPal account, click this link and follow the directions to enter your payment method. 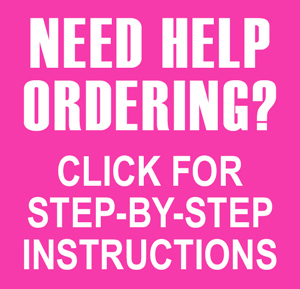 As soon as your PayPal payment processes your order will be deemed complete. If you have ordered digital products, they will be available immediately. If you have ordered physical products, they will be shipped within 2 business days. When your payment is complete, you’ll be returned to an order summary page on our site. B. You will see a pop-up box that looks something like this one. 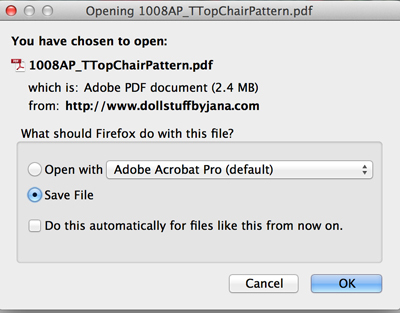 Save the file to your desktop. 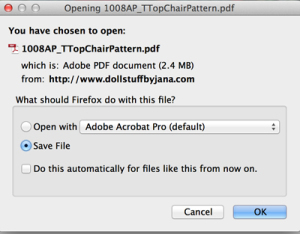 If you don’t have a copy of Acrobat Reader, you may get one free at http://get.adobe.com/reader/. You have now successfully set up an account and placed your first order. When you click the LOGIN/REGISTER link (A), you use the LOGIN side of the screen (B). If you forget your password, click Lost your password? (C) and follow the instructions to create a new password. Everything else works the same. 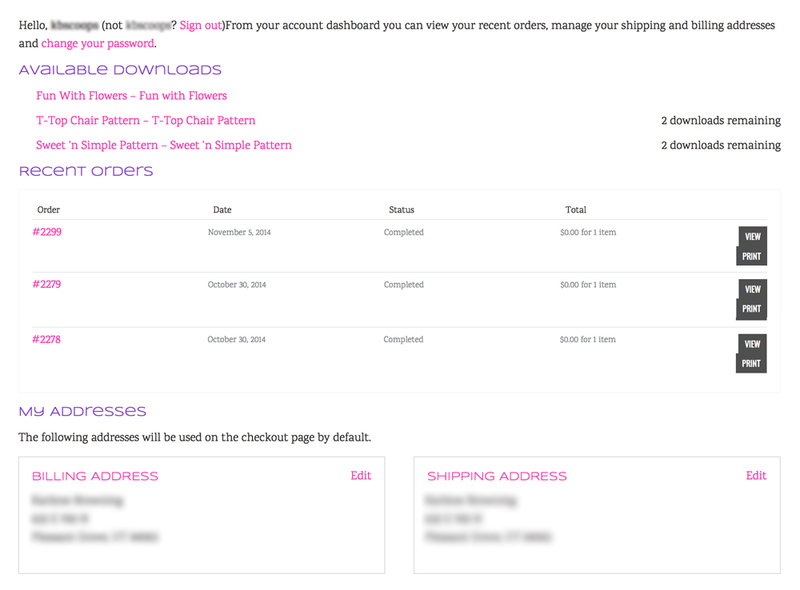 You won’t have to re-enter your Billing and Shipping information but if you need to change it, click on My Account in the top right-hand corner. From your account page, you can update and edit just about everything. If you have any other questions about using this site, please contact us!